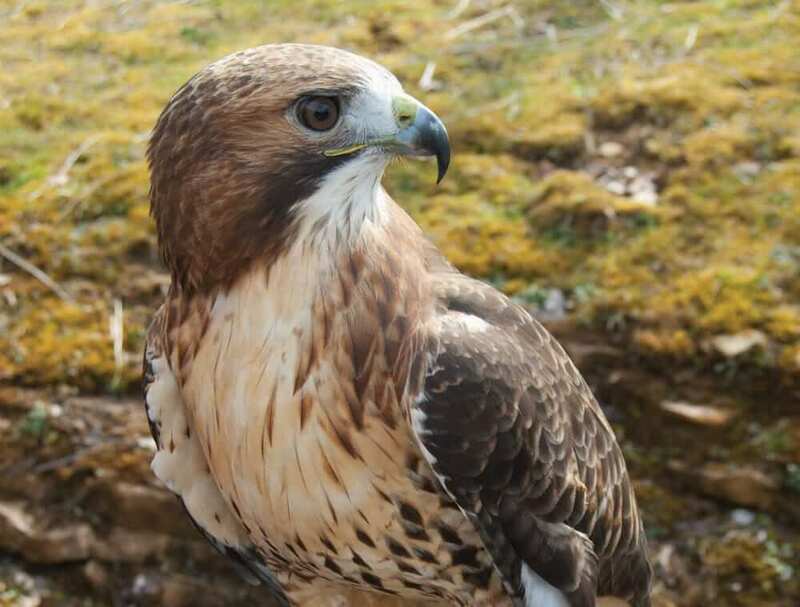 The Avian Conservation Center of Appalachia takes flight, rehabilitating winged creatures from robins to red-tailed hawks. Canaan, a red-tailed hawk who can no longer fly, nestles on the gloved hand of Katie Fallon, who is feeding the bird on a sunny spring day. “She prefers mouse heads and torsos over mouse tails,” Katie says as Canaan spits out a mouse tail. Canaan was found lying on the ground by Fallon’s husband, Jesse, a veterinarian at Cheat Lake Animal Hospital, during a fishing trip in Canaan Valley with friends. Canaan got to crash the boys’ weekend by spending the last day of their trip with them before traveling back to the Avian Conservation Center of Appalachia, which was co-founded by the Fallons. Now, she enjoys a luxurious life at the center as an education bird. Her calm personality and large size surprise and intrigue audiences during programs. “Usually when you get Canaan out of her travel carrier, all of the kids in the audience go ‘whoa’ because it is unexpected how big she is,” Katie says. The Fallons established the ACCA in 2012 with friends Erin and Todd Katzner to help conserve birds throughout Appalachia because of the wide variety of species that nest in the interior hardwood forests in West Virginia and the surrounding areas. 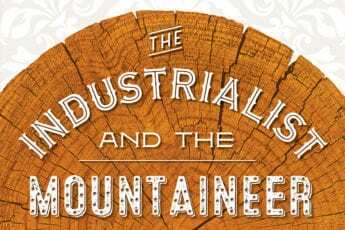 “Appalachia has the best birds,” says Katie—meaning a large variety of unique species. “West Virginia has more breeding cerulean warblers and wood thrush than any other state.” Those are two of the fastest declining songbirds in North America. The center treats all species of injured native migratory birds found in the wild, which range from small, speedy hummingbirds to majestic birds of prey such as eagles. 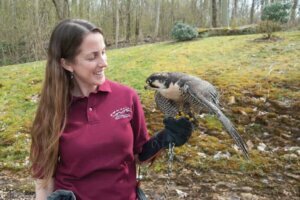 Last year, the center treated more than 300 injured birds of 50 species, “which is a lot for our volunteers to do,” Katie says. 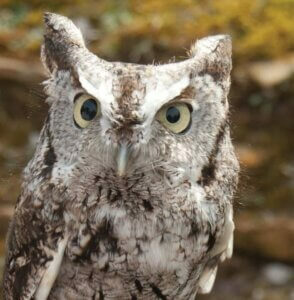 Their most common patients were robins and screech owls. That number is up from about 150 the first year, Jesse says. Some of the most common incidents that injure birds include being hit by a car or shot by people, flying into windows, and, in some instances for smaller birds, attacks by domestic cats. Nestled in a wooded area full of the sounds of woodpeckers tapping on trees and the sights of Cooper’s hawks soaring above, the ACCA is located on the same property as the Cheat Lake Animal Hospital. “That was really important to us when the organization started and it’s very important to us today,” Katie says. Because the animal hospital is open 24/7, it is easy for people to drop off injured wild birds. Every bird that enters the center receives a full exam and is treated through various practices, from medication to acupuncture. Around 40 people volunteer each year as frequently as every day; others work once a week. Volunteers help transport and exercise birds and clean the center. The organization does not currently have enough space for a flight enclosure where the birds can fly freely while still being contained. To ensure the birds get plenty of exercise, volunteers fly them on a creance, which works like a leash for the bird and allows it to fly a short distance. Pre-veterinarian students volunteer by shadowing Jesse, a veterinarian at Cheat Lake Animal Hospital who conducts most of the surgeries on the birds. Others help out by raising money for the organization. “It feels good to give back and conserve the ecosystem,” says Ashton Fox, a volunteer who plans to become a veterinarian. Volunteers spend a lot of time conducting research projects and are “always looking for more projects we can do to get citizens interested in conserving birds,” Katie says. 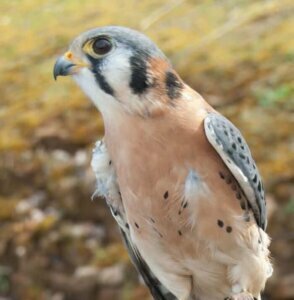 The American Kestrel Nest Box Project is an ongoing program. American kestrels are the smallest and most common falcons in North America, and their numbers are declining. The center partnered with the state Division of Natural Resources (DNR) to find landowners who are willing to put kestrel boxes—similar to big bird houses—on their properties. This way, the center can monitor the avians’ lifestyle and watch for chicks. The boxes serve as “an appropriate habitat to urge kestrel nesting,” Katie says. Another project, started by center co-founder Todd Katzner, is to check the amount of lead in avian scavengers, such as turkey vultures. The lead commonly enters birds’ bloodstreams when they eat from gut piles that hunters leave behind, and it can make birds sick or even kill them. Hunters can avoid this by using non-lead ammunition. The center cares for eight non-releasable birds that cannot live on their own in the wild, including Canaan, and uses them for on- and off-site education programs to teach local children about the importance of birds in the ecosystem. “Education is really where you make the big difference—it’s really how you change the future,” Katie says. The public is treated to a wide array of birds and behaviors, too. “Every bird has its own personality,” Jensen says as Tundra, a peregrine falcon who is also too injured to thrive in the wild, perches on her hand. “She is kind of a brat,” says Katie, who compares the bird to her 2-year-old. However, Tundra is a popular education bird. “She was not raised by humans but took to being around humans very well,” Katie says. The ACCA receives money from the state DNR; however, the vast majority of funding comes from donations made by private citizens and foundations. The organization is raising funds for future plans to move to a 35-acre farm in the Cheat Lake area where there will be enough room to build a flight barn and an educational center for more on-site programs.